Dec 2017 Events and update! I hope this finds you well and full of Autumnal and appley joy! Join us to chatter together and get in the festive feeling as we’re making Christmas chutney!! Get a free jar and recipe to take home! Meet 10am @ St Mary’s Church, Bramall Lane. Meet Mick, Daniele and I to join in some apple juicing of some of the lovely apples we’ve picked recently! With Timebuilders St Mary’s gardening group. If you are interested in joining Timebuilders please speak to Paul. James says……”In this session ‘ll be learning about growing garlic – as usual you’ll get some to plant and take with you. 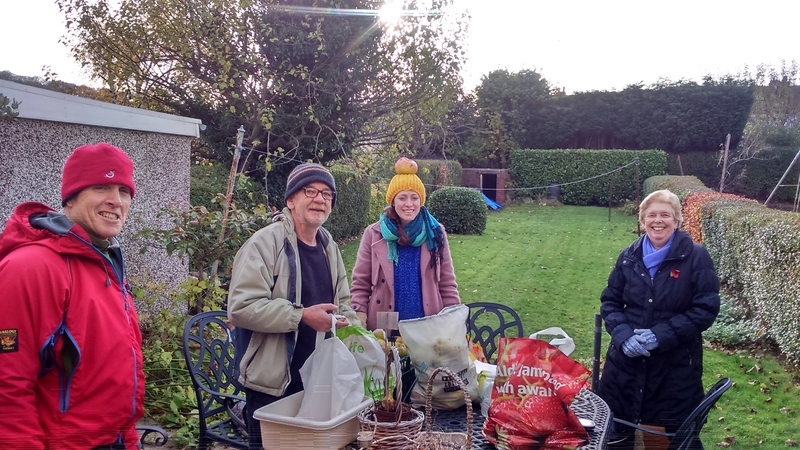 We’ll also be looking at planting fruit trees and bushes (again as we didn’t spend much time on this last session) and making super healthy sprouted bean salads! We”ll be discussing what we’ve learned during these Abundance sessions, how to harvest, how to approach tree owners, public trees, safe juicing, how to record what we’ve done etc, a chance to reflect and think of next season 2018! Open to all Abundancers as well who want to learn more and recap on their experience! Bring your laptop if have one, a few will be available to share otherwise. SUN 10th DEC 11am -Harvesting possible- If you would like to join us rescuing some apples then please get in touch! WED 13th DEC- Christmas chutney making-last session! leaders places still available! See below! SAT 16TH DEC-Abundance Christmas/Solstice Social! 7-10pm @ Union St, city centre -any ideas and assistance welcome! Magical musical warmth brought to you by 3 Abundancers booked already- get in touch if you would like to get involved! There’ll be a games or 2 and a chance to catch up with fellow Abundancers! We will have this a little bit of a fundraiser with a suggested donation of £1-3 but let money be no barrier if you are skint please come anyway and bring your lovely self! Bring festive nibbles to share and your own drinks! We’ll have chutney on sale as well! CHUTNEY NOW ON SALE FOR CHRISTMAS/SOLSTICE! Our delicious chutney is available at £3/jar or 2 jars for £5. Excellent addition to all festive food! Get in touch for details! #We can pay 40p a mile for fuel and reimburse bus fares but please tell Lucy in advance so she can bring some money! #Supervised children welcome-let us know if you are bringing dogs so can chack with tree owner please! #And a drink and snack as fruit munching will make you hungry! #Please wear sensible shoes and dress for the changing Autumn weather! Many Abundancers share fruit to nearby places as convenient to them, if you would like to share fruit near you, just speak to the harvest leader. Also we’d prefer to share with places we haven’t given to yet if possible. New places welcome if they are where lots of people go, e.g. libraries, community centres, churches which hold food banks, community groups,etc) Thank you to all Abundance sharers! Here is the updated Abundance Sheff Training Manual which covers all aspects of harvesting, sharing,recipes, preserving, juicing. Includes all Volunteer Roles (Harvest Area Coordinator, Preservation Officer, Community Sharing/ Events Coordinator) to build your cv & life skills! Thanks very much to those of you who have contributed so far and your ongoing support. #We are now independent from Grow Sheffield, but still receiving some support. #We have decided to become a constituted group(like a steering group)– do text if you’re interested in joining the group! #We are still working as a network of small groups of Harvester Coordinators and Abundancers across Sheffield centrally supported by Lucy as i am able. Darnall Community Allotment) and for a few coordinatorhours. #Various training of volunteers has happened and is ongoing, with groups and individuals. WordPress website training, Abundance Trike Training. Thanks very much to everyone who has contributed so far. in our community partnership work.